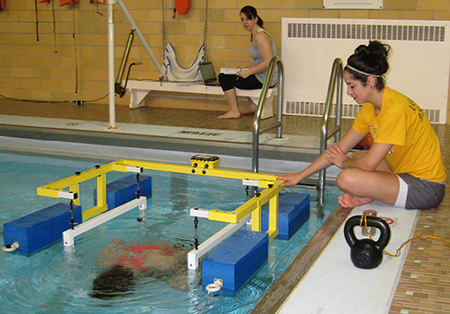 EXERTECH® Underwater Weighing Equipment – The most accurate way to determine lean body mass and body fat percent. Underwater weighing in a swimming pool with the FLOATAWEIGH. Underwater weighing with an EXERTECH stainless steel tank. Body fat percentage can be accurately estimated by weighing a person who is completely immersed underwater. How It Works (Archimedes Principle): The buoyant force on an immersed body is equal to the weight of water displaced by the body. An accurate underwater weight is all you need to get lean body mass and fat percentage by the gold standard method used in research labs. EXERTECH® weighing systems are safe and simple to use. You don’t have to be an expert. If you can weigh someone on a scale, you can do this. EXERTECH® is the sole source for a unique radio-telemetry weighing system using 4 load cells and powered by ordinary flashlight batteries. The FLOATAWEIGH™ is a patented underwater weighing system on floats. It can be used in any swimming pool with a 3 foot water depth.